Human rights investigations are a central aspect of the response provided by the UN to human rights violations and a first step towards accountability, reparations, truth and non-recurrence. Since 2009, Gender Advisers are deployed to International Commissions of Inquiry, Fact Finding Missions and other UN investigative bodies, thanks to the partnership of OHCHR, UN Women and Justice Rapid Response, to support the integration of a gender perspective into the investigations, including in the documentation of sexual and gender-based violence. This event will explore the most recent developments in terms of guidance and practice in this area. 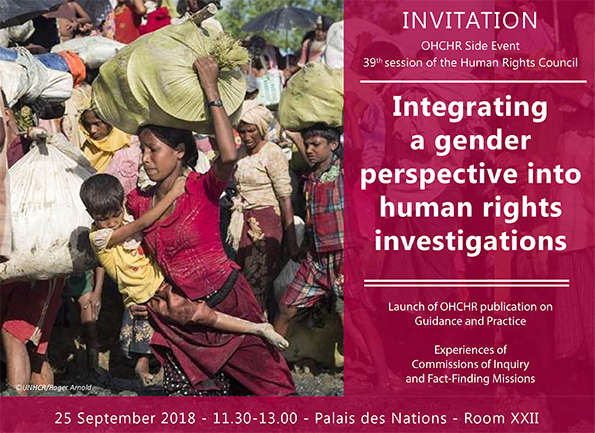 OHCHR is pleased to launch a new, practical tool providing expert advice on how to integrate a gender perspective in human rights investigations.